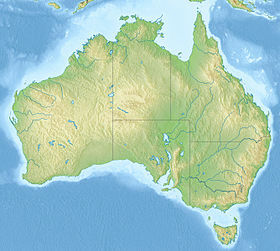 Shark Bay is a large bay on the west coast of Western Australia. It is about 800 km (497 mi) north of Perth. In 1991, the bay, its islands, and the land around it were added to UNESCO's list of World Heritage Sites. Shark Bay has three important features to protect. It has the largest seagrass beds in the world. These are home to about 10% of the world's dugongs. And at one end of the bay are stromatolites, which are the oldest form of life on the Earth. The protected area covers 2,197,300 ha (5,429,647 acres). The area protected by the World Heritage Site is made up of different areas. About 70% of the site is marine environment protected by national parks and reserves, and includes 1,500 km (932 mi) of coastline. About 20% was used for farming, but half of this area has been taken over by the government and is now conservation area. About 6% is in national parks and reserves. 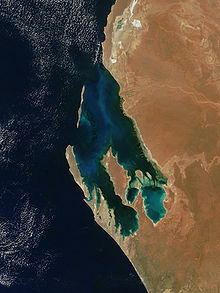 ↑ UNESCO, "Shark Bay, Western Australia"; retrieved 2012-4-23. ↑ "World Heritage - Managing the World Heritage Area". sharkbay.org. 2012. Retrieved 22 April 2012. This page was last changed on 28 February 2018, at 17:44.